Muses Suites, located 7 km from Naxos town, in front of Plaka Beach, is a small hotel, enriched with Greek, traditional details. All the rooms have fully equipped kitchen, radio, telephone, private safe, air-condition, hairdryer and sea view. sea view (2pax-4pax). It has two bathrooms, one on each floor. We suggest for a family with small children that they used to sleep together . Thalia: is a two floors maisonette with a bedroom on the ground floor and a living room -on the first floor .It has two bathrooms , one small bathroom with step in the bathroom in the first floor and bigger bathroom with bath [ Jacuzzi] in the ground floor . The balcony is in the first level and has front sea views. 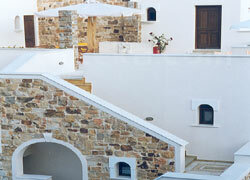 Clio: small suite with two rooms’ bedroom with double bed , and living room with 2 single beds, romantic, balcony with sea view. Euterpi : studio for 2 pax the only one, with 2 single beds and the only one with terrace from the sunrise side limited sea view ,more to the landscape. Melpomeni: maisonette for 2-3-5 pax with wooden floor one bathroom with 2 balconies [ the one balcony with front sea view has pergola ,saved from the sun and rain]. Kalliopi: maisonette for 2 pax with wooden floor, 2 balconies as well. Erato: small suite in 2 rooms with a big terrace with front sea view and 2 smallest balconies to the landscape for 2-3 adults or 2 adults and 1-2 children.